There seems to be ever increasing interest in PNC's lately. But do you really know what a PNC is? PNC stands for Postal or Philatelic and Numismatic Cover which is generally a joint philatelic (stamp) and numismatic (coin) envelope. In Australia, for example, official PNC's are endorsed by the Royal Australian Mint or the Perth Mint and released by Australia Post using their coins. Issues such as The Ashes PNC were also endorsed by the cricketing body Cricket Australia. Some PNC issues are also numbered and may be 'limited editions'. Beware of what you are buying as it is becoming more common for 'backyard operators' to crudely revamp a philatelic first day cover by adding a coin and marketing these as something special - they are not! There are some genuine unofficial pnc's that hold a place in Australia's history. The "Yarralumla" PNC is highly sought after by collectors. 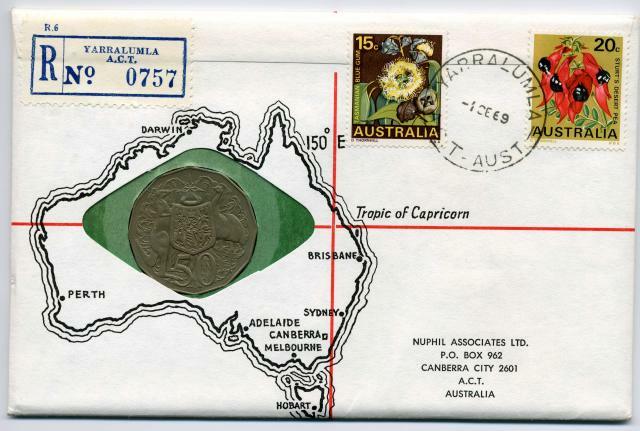 Private company Nuphil Associates Ltd commissioned the RAM to produce 50 cent coins in 1969 to make these covers. The RAM however could not meet the numbers of coins needed so ordered a special striking. The coins contained in these PNC's were a specimen striking of the fifty cent not available elsewhere. These were postmarked at Yarralumla, ACT and backstamped in Canberra City on the same date. These PNC's were sold originally for USD$7.50 each and now fetch $800+.